Combine and whisk together dry ingredients (baking soda, Epsom salt, citric acid, corn starch). In another small bowl, add coconut oil and melt it. To make concentrated green tea you are just making a strong green tea. So just take one of the green tea bag, and add about 1/4 of hot water. Let the green tea sit for awhile then add 1 tsp of the green tea concentrate. Next add 1/2 tsp of tea tree oil. Mix wet ingredients together then slowly add wet ingredients to dry ingredients. If you add it too fast, it may start to fizz. Whisk the ingredients together. Next is an optional step. I took another green tea bag and cut it open and took out the dried leafs. I next added it to my mold. I used ice sphere molds to give it the ball look. If you don't have any molds you can use a cupcake tin as well. Next pack your bath bomb mixture into your mold. Let it dry for several hours to over night before totally taking out of mold. Give it another day to fully dry. 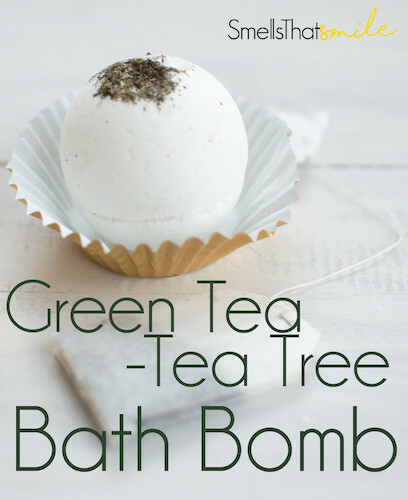 Once ready, enjoy a relaxing bath that will leave your skin feeling smooth and refreshed.